weazen (wee'-zen) v.i. to shrink or shrivel, to cause to shrink. that frat boys won't like. Greetings from the middle of another busy week! The first big trade show of the year is now a matter of days away, and getting ready for that is starting to dominate everything else around here. 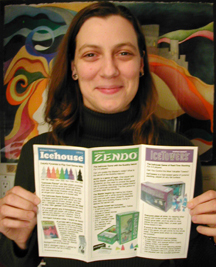 Here's a picture of Marlene showing off the new brochure she created this week, called "Marlene's Guide to Icehouse." Since Marlene's favorite Icehouse game is Volcano, she used the back of this brochure to promote that game, including a summary of the rules along with a really cool Volcano board. The idea is to encourage Icehouse new-comers to start out with either IceTowers or Zendo and then add on Volcano with 2 more stashes and this brochure. Not only are we making new marketing materials for Toy Fair, we're also making appointments in advance. This obviously-good idea is one we've never done before, since we've never had someone on our team who was good at that sort of thing (or, as we like to say, has the "sales gene") but now that Ali Summers (who totally has the sales gene) is working for us (and who just joined Ginohn's Graveyard), buyers are being called, and appointments are being set up! Amazing! Anyway, I'm still hoping to send *something* to my playtesters before we head off to Toy Fair... but no promises. 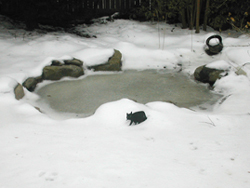 PS: Here's a photo I just took of Alison's Pond... compare it to the snowed-in version from a week ago! "As a fighter pilot in the Air National Guard, Mr. Bush was required not just to report for duty but to log a minimum number of hours of flying time per month to maintain his qualifications to fly. Based on a number of newspaper accounts and official records obtained through the Freedom of Information Act, he did not show up for duty and was grounded for not taking a required annual physical exam. His failure to report for duty as ordered and to log his flying hours to maintain his state of readiness as a fighter pilot when others his age were fighting and dying in Vietnam calls into question his character and traits as a leader. Although Mr. Bush was never penalized for shirking his duty, his conduct is relevant today in that it casts doubt on his credibility as our commander in chief. It should not be ignored by the media." -- John P. Soder Jr., "Mr. Bush's Guard Service"
"Over the years new equipment and additional astronauts would be sent to join the original crew. In time, the colony would grow to the point of being self-sustaining. When this stage was reached, humanity would have a precious insurance policy against catastrophe at home. During the next millennium there is a significant chance that civilization on Earth will be destroyed by an asteroid, a killer plague or a global war. A Martian colony could keep the flame of civilization and culture alive until Earth could be reverse-colonized from Mars. Would NASA entertain a one-way policy for human Mars exploration? Probably not. But other, more adventurous space agencies in Europe or Asia might." -- Paul Davies, "The Next Giant Leap For Mankind Won't Come Without Risk"
UBCON: We're the Guests of Honor!